These are games that have been used in various classrooms. Some are rather specific to a location and would need to be adapted to a new territory, use them as a template for your own version. Extinct birds is a ‘battleships’ like maths game where children cover squares on a number board with the bones of some extinct birds in a cave and then attempt to find their partner’s bones before their own can be uncovered. A card game that is great for vocabulary building or just getting students to create questions. In school we rarely get students to make their own questions, but we frequently make them answer ours. 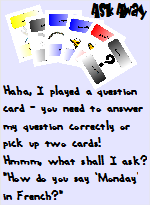 This card game features a Question card which makes the player ask another player a short question, which they should create. This game is available as a print on demand publication at the thegamecrafter.com.